This time of year it’s hard enough negotiating calm with your small humans, but Fireworks night tends to be a tough time of the year for pets too. So we sat down with veterinarian, Dr Thom Jenkins, who gave us the low down on how to minimise the stress our furred friends experience. What can pet owners do in advance of fireworks night to prepare? A lot of pets, even those that are normally pretty calm, struggle at this time of year. Animals typically have much better hearing than we do. As such, they can be even more sensitive to the loud whizz, bangs and whistles that fireworks produce. This means that unexpected noises are not just a source of stress for pets but can also actually cause pain. However, we can do quite a lot to prepare pets for the inherent stresses of fireworks night. Owners that are particularly concerned should seek behavioural advice as far in advance as possible. For example, it is possible to help reduce a pet’s sensitivity to noises associated with fireworks, and thus reduce the stress. However, this desensitisation process can take several months. There are pheromonal diffusers that appear to work in some pets that your vet can recommend. At short notice, in the most severe cases, your vet may need to prescribe medication to mitigate the stress and anxiety induced by fireworks. What should pet owners do on the night itself? Keep your pets inside. Even if this means bringing forward your dog’s walking time. Many animal shelters report an increase in lost pets around this time of year as the loud noises can scare pets into running away. Close all windows and ensure your pet is registered on a microchip database. A physical ID in the form of collar tags are also useful to aid the safe return of your pet. Familiar sources of noise, like the television, can be used to help drown out the fireworks. Give your pets a space where they can hide and feel safe/protected. Provide reassuring scents, in the form of the pet pheromones if you’ve found those to work and/or your own scent. Tasty treats can also work well as a distraction. Do your best to be there for them and provide reassurance, while trying to remain calm yourself. What are the signs that pets are suffering from stress/anxiety relating to fireworks? Cats and dogs will often hide away. Alternatively they may pace around meowing or barking more than usual. In cats, over grooming through repetitive licking is another common sign. Cats may also express further undesirable behaviours, such as clawing furniture or scent marking. It’s important we don’t add to the stress by over reacting. Instead be aware of and sensitive to the trigger for these behaviours. Dogs often lick their lips and yawn more when they are stressed. More obviously they may even visibly tremble. If your pet is exhibiting any of the above signs, it’s important that you seek veterinary advice on what more can be done to help mitigate the stress and anxiety they are experiencing. 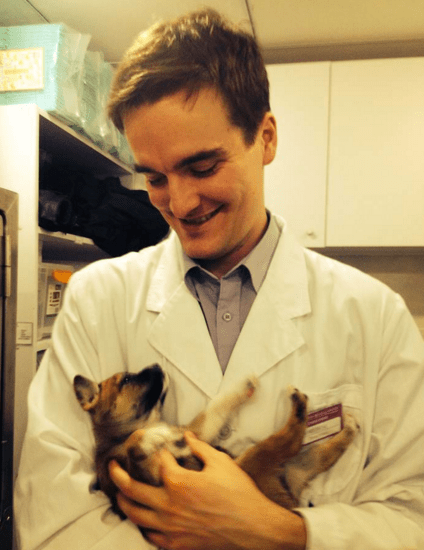 Dr Thom is the Founder of Gula, a veterinary video consultation service for pet owners. Us too! Our relatives all have pets but we can’t decide yet if we should or what to go for. This is such an informative piece, thank you so much for providing some solutions! My dog is getting better with loud noises but this year was awful for him with new fireworks displays closer to home popping up. Fortunately we had a huge supply of tasty treats on hand and put his favourite program on the TV to calm him down. I know, I feel so bad for them they get such a raw deal this time of year!